In early July, 2013, Daytona International Speedway embarked on a $400 million redevelopment project referred to as DAYTONA Rising. The goal was to transform the speedway and give racing fans the ultimate experience, everywhere in the stadium. 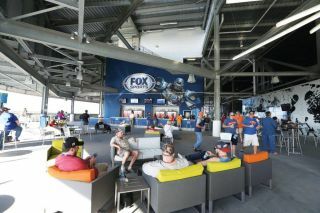 In addressing this goal, DIS focused on the importance of technology in enabling the ideal fan experience and sought out partners to add to its DAYTONA Technology Platform. While DIS was looking for a wide range of technology solutions to support the project, a key emphasis was placed on the need for outdoor, weatherproof displays. Digital displays would make the impossible possible – fans would never have to miss a minute of the action, no matter where they were in the speedway. This meant DIS needed to find a solution that would be fully operational in extreme temperatures and weather conditions, easy to install and maintain and be viewable in direct sunlight. DIS reached out to multiple suppliers, who competed head-to-head for the DAYTONA Technology Platform partnership. Suppliers competing for the project ranged from commercial display manufacturers to consumer TV manufacturers. In comparing the solutions offered by each supplier, DIS found Peerless-AV’s solutions to offer the outdoor, weatherproof and direct sunlight readable capabilities needed. Peerless-AV’s displays would accommodate DIS’ needs while coming in on budget. DIS decided on two XtremeTM Outdoor Daylight Readable Display models – 47” XtremeTM Outdoor Daylight Readable Displays (CL-47PLC68-OB) and 42” XtremeTM Outdoor Daylight Readable Displays in portrait orientation (CLP-42PLC68-OB). Peerless-AV’s solutions addressed all of DIS’s needs, providing weather resistant solutions that were versatile, maintenance free and provided the viewability necessary. DIS had a tight timeline for the project, requiring the installation to be complete by the 2016 Rolex 24 At DAYTONA and the DAYTONA 500. The outdoor displays were one of the last solutions installed at the speedway and Peerless-AV was fully prepared throughout the process. The displays needed to be mounted throughout the entire speedway, including in the concessions, stadium concourses, garage/pit areas, bathrooms, and more – wherever a display would fit, a display needed to be installed to ensure fans would never miss a minute of the action. The Integration Factory managed the installation, which was completed on schedule. During the installation, the Integration Factory experienced an obstacle regarding varying mounting column sizes. There were five to six different sized columns, which resulted in the creation of custom mounting solutions that could attach Peerless-AV displays to a variety of different columns. Once the mounts were installed, the mounting of the displays began. The displays offered a plug-and-play setup for the Integration Factory. Installing media players behind the displays and plugging all of the AV into electrical sources were the final components in the process. In total, over 800 Peerless-AV Outdoor Displays were installed throughout the Daytona International Speedway.